At Orbitz our years of experience installing and maintaining lifts and elevators makes us very aware of what solutions our clients really need: lift systems which are price competitive and reliable. The Silens-Pro Mega cuts installation time and saves money. Our Installation procedure allows easy assembly of the lift system with greater access to the shaft and throughout. We Supply clear instructions, highly detailed packing lists and a range of product-specific assembly tools which make your work even more straightforward. The lift’s electrical components are supplied pre-tested and it’s connectors pre-assembled. Our team of skilled engineers is dedicated to the systematic streamlining and effectiveness of your elevator’s operations. We provide technical support, based on our wealth of practical experience, covering both the electrical and the mechanical aspects, from the start of installation works right through to maintenance operations. 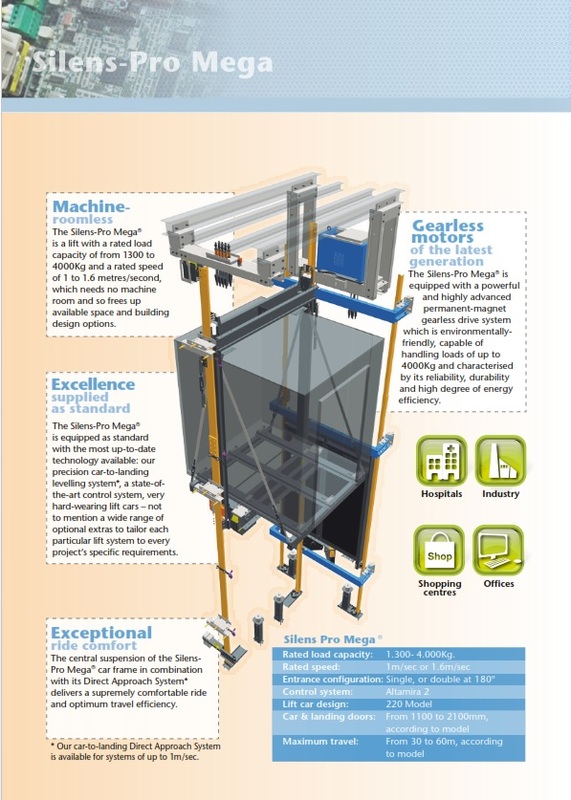 The Mega is a lift system designed to be reliable and long-lasting. We guarantee you the efficient supply of spare parts as required, throughout its entire working life. The Mega is a high performance lift system of proven reliability – making maintenance work an absolute minimum therefore a cost effective solution long term. The Silens-Pro Mega comes equipped with all the elements required to anticipate and prevent accidents, to enable two-way communication and to facilitate fast and efficient passenger release. Our Direct Approach System also reduces travel time compared to lifts unequipped with it. Both this feature and a major improvement in the lift car braking system cut the system’s energy consumption. The entire Silens-Pro range has been designed, manufactured and tested from start to finish by our partner IMEM Lifts – producing a highly competitive global solution of proven quality & reliability. The lift system is supplied compliant with EN 81-1:2001 A3:2010 and Directive 95/16/EC. On request, it can also be supplied compliant with EN 81-21:2009, EN 81-70:2003, EN 81-72:2003 & EN 8171:2005 – among others.